This entry was posted in After, Clothing, Knitting by textillian. Bookmark the permalink. It’s very lovely. Your mother-in-law is very lucky – a son-in-law who is charming, talented and can locate a loom when needed! Your mother-in-law must love her beautiful cowl and adore you! Is there any knitting in Mr. Penney’s future? I wonder if he is now inspired to learn how to knit. I enjoyed hearing how you worked out the design and the seed stitch border. 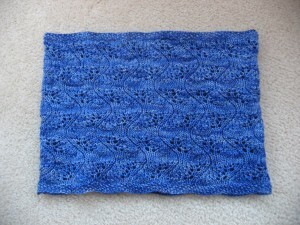 The yarn is so pretty and the pattern plays so nicely with it, creating one gorgeous cowl.